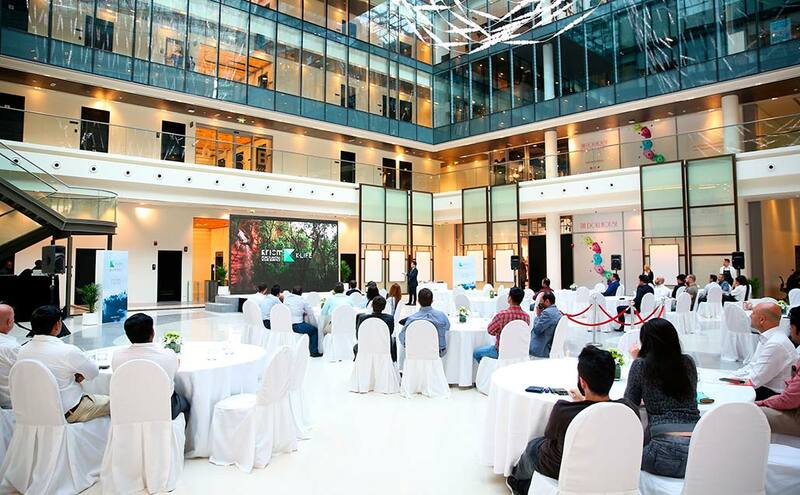 On the 24th of April, the official presentation of KRION K-LIFE and its KEAST technology took place in the United Arab Emirates city of Dubai. This public presentation was made by the company Cloisall Co. LLC, a leading interior design and fittings contractor in the UAE, operating in the luxury sector. For this presentation, Cloisall selected the design district, which nurtures the emerging local talent and provides a space for the creators of the region. What better place than “Dubai Design District (d3)” to present the solid surface that improves our quality of life to construction and design professionals? The work of PORCELANOSA Group, K-LIFE, with its KEAST Eco-Active Solid Technology ® was presented jointly by Daniel Pulleiro, belonging to Cloisall, and Enric Dembilio and Jose Luis Gutierrez from KRION. Apart from discovering the revolutionary leap obtained by KRION in the world of solid surface, purifying air through photocatalysis, attendees enjoyed an organic aperitif as innovative as the material.